Ouvvaiyaar is a legendary— even mythical — poet in Tamil literature. With the name meaning in Tamil “The respectable Old Lady,” one can imagine the exalted place her name occupies among Tamils, scholars and commoners alike. Literary historians believe that more than one person went by the name. For example, there was one Ouvvaiyaar in the Sangam Period (2nd century BC to 2nd century AD), and one in the 10th century. They conclude this after carefully analyzing the phrases and vocabulary used in the literary works attributed to the Poetess Ouvvaiyaar. From her literary works, we learn that he was a Saivite, grandmotherly, austere mendicant, full of wisdom on the way of the world. Her message transcends time, place and cultures. Rice paddy is threshed to get rice grains. The husk is discarded. Without the husk intact in the paddy seed, though, it never can germinate. Without critical subordinate help, one accomplishes nothing. Here is a great lesson on interpersonal relationships for ambitious and aggressive MBA students and other graduating seniors who will be starting their careers making big bucks while managing other people’s resources and assets in corporations. This is also a good advice for doctors, engineers, lawyers, managers and business owners, who are in great haste trying to climb their career ladders and amass wealth, not paying attention to how they trample on their colleagues and subordinates. Till even 70 years ago, Tamil alphabets in schools were taught using Ouvvaiyaar’s works, Aathi-choodi and Kondrai-vendan. In these, each alphabet was vocalized — like a for Apple, b for biscuits, c for cat in English – but with this major difference: Each Tamil alphabet – like a aa, e, ee, u uu… — was elaborated with an advice starting with that alphabet, that conveyed codes of conduct, such as “Be charitable”, “Be helpful”, “Control your temper”, “Don’t give up efforts” … … In today’s teaching of Tamil in elementary schools, these are completely gone. 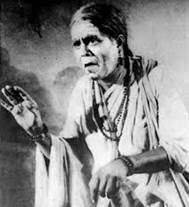 She is so popular among the Tamils that decades ago they made a popular play on Ouvvaiyaar, with T K Shanmugam (see the picture on above), a male actor, playing the role of Ouvvaiyaar. A black-and white film was made with the famous K B Sundarambal playing the role of Ouvvaiyaar. This entry was posted on January 24, 2019, 1:18 pm and is filed under January 2019, Past issues. You can follow any responses to this entry through RSS 2.0. You can skip to the end and leave a response. Pinging is currently not allowed.